It's officially summertime and no doubt you will be exposing more of that skin to keep cool during the summer months. SeabuckWonders would like to help you keep you safe while enjoying all that summer has to offer, with their natural line of skincare products with SPF. They are currently offering a Summertime Sun Safety Special. Buy any berry oil, body lotion, or facial cream and receive 50% off through 7/7/2013! Just enter coupon code: SUN50 at checkout. DO use sunscreen! There are so many to choose from—something for ALL ages and with specific degrees of protection based on your needs. Obviously, the very fair need more protection than those with more melanin in their skin; however, we ALL need protection so apply a little “common sense” with your sunscreen. It’ll go a long way! 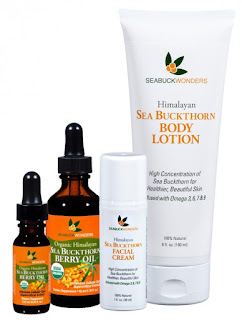 For those seeking natural UV protection, try using products that contain sea buckthorn (such as SeabuckWonders body lotion, facial cream and hydrating serum). The sea buckthorn berry contains natural UV properties, so you receive protection from the sun everytime you use one of these products! DON’T ignore changes in your skin—especially a change of color, size or shape of a mole. This could be a tell-tale warning sign that you may have a serious skin condition. Many lives can be saved by paying attention to these types of changes and then taking immediate action. According to the American Academy of Dermatology (AAD), one in five Americans will develop some form of skin cancer during their lifetime. Don’t take chances! DO treat any sunburned skin with moisturizing lotions and gels. SeabuckWonders body lotion is a perfect solution due to its high content of the rare Omega 7. Omega-7 fatty acids promote tissue regeneration and anti-inflammatory action in the skin and mucosa. DON’T forget about your lips! The lips are a common site for skin and lip cancer due to extended sun exposure without any protective sunscreen. Look for lip-specific products that contain an SPF of 15 or higher. DO use common sense! Protecting your skin is not rocket science. If there is something you DON’T know, just hop on the Internet. There are a plethora of resources that provide great information if you have ANY specific questions or concerns about summer skin protection. SeabuckWonders would also like to offer one Girly Girl reader the chance to win a full set of skincare samples. To Enter: Leave me a comment telling me one SeabuckWonders product you would like to try. You can get extra entries for following GGG through GFC, Subscribing via email, liking us on Facebook and following via Twitter. This giveaway will end on July 8, 2013. I will choose the winner using Random.org. Please leave a valid email address if it is not visible in your profile. US entries only. I would like to try the Deep Hydrating Serum. I would like to try the exfoliating facial cleanser. I would like to use the Deep Hydrating Serum! I'd like to try the exfoliating facial cleanser. I would like to try Sea Buckthorn Deep Hydrating Serum. I follow GGG through GFC as Maryann D.